There are 3 billion people in developing countries that rely on solid fuels for almost all of their cooking. 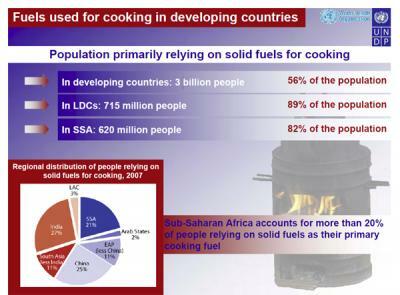 The question can be asked how many of these over 800 million households cook with an improved stove? The answer comes from a new study by the World Health Organization (WHO) and the United Nations Development Programme (UNDP). Like any good mystery story you will have to skip to the end for the answer. All I will say is that the results may surprise you. The statistics in Doug Barnes' article are drawn primarily from this WHO United Nations report, which has some Great Information about Biomass Energy use and the Health Impacts of that use. The "Energy Access Situation in Developing Countries - A Review focusing on the Least Developed Countries and Sub-Saharan Africa" report draws attention to the energy access situation beyond the conventional focus on electricity, especially in poorer developing countries where access is the most constrained. Three billion people, i.e. almost half of humanity, rely on solid fuels –traditional biomass and coal – as the available modern energy services fail to meet their needs. More than 80% of people in LDCs and SSA primarily rely on solid fuels, compared to 56% of those in developing countries as a whole. Two million deaths per annum are associated with the burning of solid fuels indoors in unventilated kitchens. Children bear 44 percent of this toll, and among adults women bear 60 percent of the burden. Almost a quarter of the world’s population still lives in darkness; over 80% of them in South Asia and SSA. More than 70% of people in LDCs and SSA lack access to electricity, compared to28% of those in developing countries as a whole.